SMART DESIGN Shelf baskets pull out and unit rotates 90° each direction so you can reach the side shelves. TAKE NOTE Non-skid shelf surface means no more crashes. TAKE NOTE On an exterior corner, cabinets with a lazy susan inside can blend in when a functional door or decorative panel is applied to the exterior. 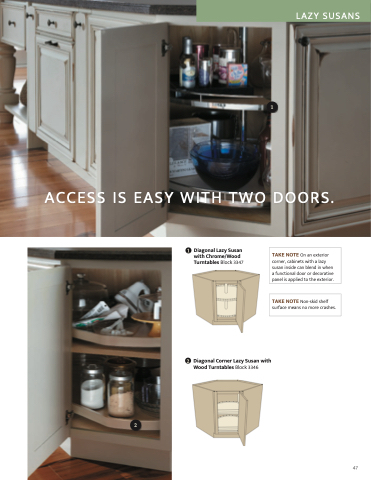 ACCESS IS EASY WITH TWO DOORS.